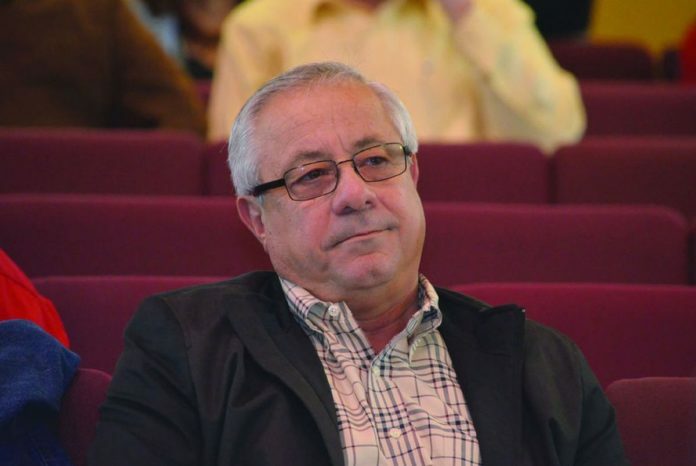 At the request of Hidalgo County, a lawsuit it filed late last year against former drainage district manager Godfrey Garza Jr., who is accused of stealing millions from the county during the construction of the border levee wall, has been dismissed. Attorneys representing Hidalgo County Drainage District No. 1 filed a notice on Tuesday to dismiss the Nov. 21, 2018 lawsuit the district filed against Garza, his wife and sons, as well as multiple project contractors, including Houston-based Dannenbaum Engineering. No reason was cited in the notice and the attorneys representing the district, Michael J. Blanchard of San Antonio and Shelly A. Sanford of Austin, did not immediately respond to a request for comment. The November lawsuit was the drainage district’s second attempt at collecting funds from Garza, who the county hired in 1996 to serve as general manager of Hidalgo County Drainage District No. 1, for which the county judge and commissioners serve as board members. Garza resigned from the position in 2000 and the county hired his company, Integ Corporation, to manage it until his 2015 resignation. Garza negotiated a contract with the county in 2007 that earned him 1.5 percent of every dollar the district spent constructing border fence atop Rio Grande levees — these were largely funded by the U.S. Department of Homeland Security. The district alleged in the lawsuit that Garza earned more than $3.7 million in commission costs between 2008 and 2012 because he “lied” about costs and invoiced the county for expenses not relating to the actual construction. In the process, Garza also conspired with local engineering firms to have them hire his wife’s company if he guaranteed them levee wall contracts, the lawsuit alleged. The November federal lawsuit was filed after visiting state District Judge Martin Chiuminatto dismissed the county’s initial lawsuit against Garza in February 2018 for lack of evidence. The county had charged Garza with engaging in fraud, conspiracy and breach of contract, and was also seeking to recuperate millions of dollars in payments it made to Garza’s company. The county subsequently appealed Chiuminatto’s decision with the 13th Court of Appeals. Hidalgo County Judge Richard Cortez, who took office in January, did not comment on Tuesday’s motion to dismiss the federal case “due to pending litigation,” according to Olivia Gomez, his assistant chief of staff. While Gomez did not clarify what that litigation entailed, it is likely related to the appeal. Both attorneys for the drainage district and Garza have filed briefs with the appellate court and are requesting to make oral arguments before the court. No court dates have been set. Were the 13th Court of Appeals to grant the county’s appeal and overturn Chiuminatto ruling, the county could continue to seek monetary damages from Garza at the district court-level. Correction: This story has been updated to reflect that the plaintiffs filed a notice to dismiss. Once a plaintiff files for a dismissal, the case is removed from the corresponding court.